The latest rendering of the Gordie Howe International Bridge. Gov. Snyder and Canadian dignitaries are gathering in southwest Detroit for official groundbreaking on the new Gordie Howe International Bridge this morning. Gov. Snyder has been instrumental in making the new bridge connecting Detroit and Windsor, Ontario a reality. He did an end-run around the state legislature and signed a deal with then-Canadian Prime Minister Stephen Harper in 2012. Six years later, they’re finally breaking ground on the U.S. side of the Detroit River. A groundbreaking is expected on the Canadian side this fall. That’s when the Windsor-Detroit Bridge Authority is expected to finalize a contract with Bridging North America, the group of private firms that will actually build and manage the bridge. Canada has been the driving force behind the new international span, which it is paying for. It sees a new, publicly-owned border crossing as a key economic driver for the country -- even as President Trump launched NAFTA re-negotiations, and threatens to escalate a brewing trade war between the two countries. Stateside’s conversation with Andy Doctoroff, special projects adviser to Governor Rick Snyder and the point person on the Gordie Howe International Bridge. Things appear to be moving ahead for construction on a new bridge between Detroit and Windsor. 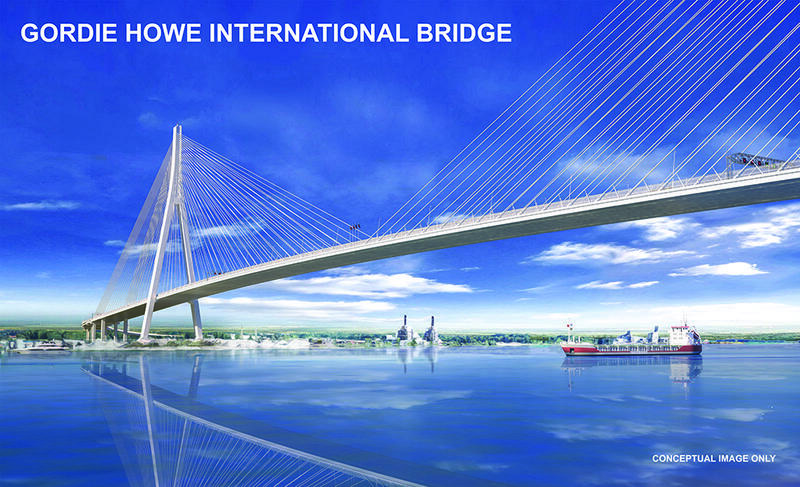 Last week, a consortium of builders was chosen to construct the Gordie Howe International Bridge. However, trade tensions between the U.S. and Canada continue to rise, and the Moroun family — owners of the rival Ambassador Bridge — recently ran an oppositional ad on Fox and Friends asking President Trump to stop construction of the bridge. The Windsor-Detroit Bridge Authority has made a long-awaited announcement about the private contractor that will build the new Gordie Howe International Bridge. That contractor is Bridging North America, which is made up of an international consortium of companies including ACS Infrastructure Canada and Fluor Corporation. Other private partners include engineering, architecture, and financial firms.